Guadalupe Island female white shark Gill Rakers was SPOT tagged in December of 2012. Since then she has made an amazing trek up along the coast of Oregon, back offshore and then venturing into the Sea of Cortez where it is assumed she went to give birth! You can follow her amazing journey in real time with the app Expedition White Shark! 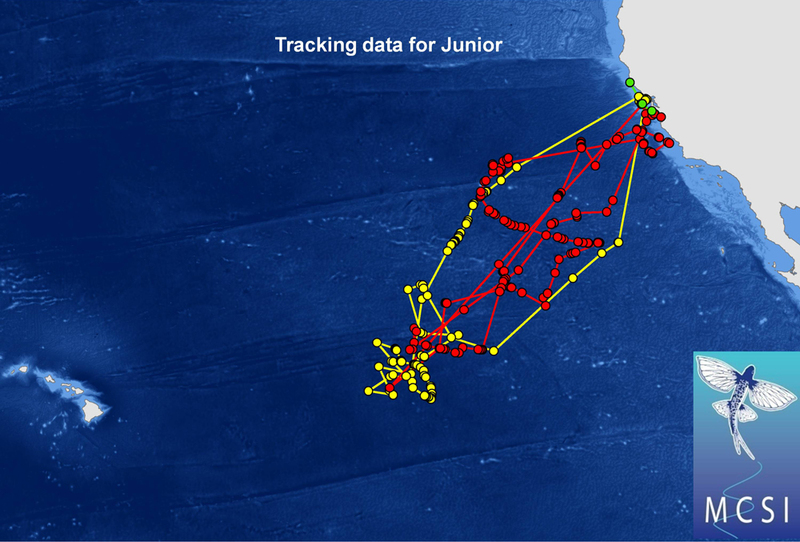 We are still getting great data from Junior, the first white shark tagged in the Farallon Islands. This map shows his 2.5 year tracking data. His last position was in northern California in November 2011, but since then we have had many single messages that do not give us location but do give us sea surface temperature. 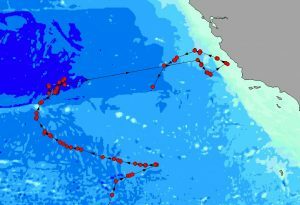 Recent temperature data tells us that he is in water of between 19 and 21 deg C (66 to 70 deg F), indicating that he has left northern California and moved to warmer water offshore. He is currently in his 3rd offshore migration since tagging! For more up to date tracking information on Junior and other tagged sharks please check our Facebook page. 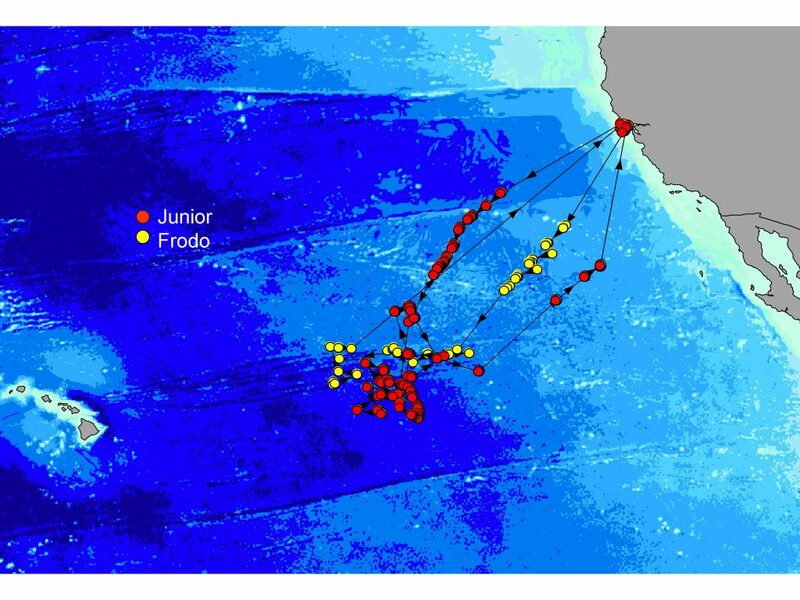 Junior made a very unusual winter sojourn to the coast of California, a time of year when we would expect him to be in the Shared Offshore Foraging Area, halfway between the mainland and Hawaii. 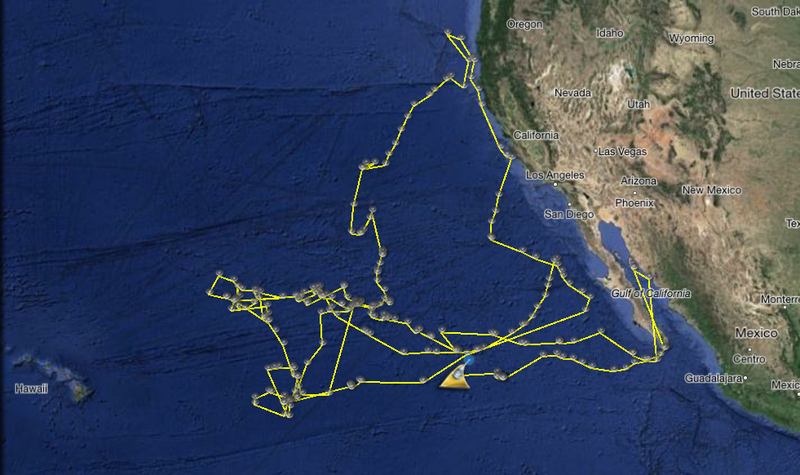 The satellite tag positions we received showed him cruising the coast south of Point Sur. Although we never detected him closer than 15 nautical miles from the coast, our tracking technology does not allow us to know where he is at all times. He was very near the elephant seal beach at Piedras Blancas and may have been lurking just offshore of that region at some point during this trip. For a brief time it looked like he was going to visit the Channel Islands and we were looking forward to mounting an expedition in an attempt to locate and photograph his current condition. Junior didn’t allow us this chance, since he soon turned around and headed back to sea in the direction of the SOFA. 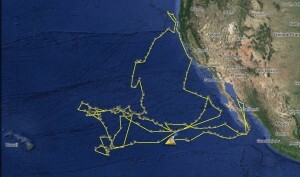 There is no way for us to know whether we just witnessed a normal, but extremely rare, adult white shark winter visit to California, or if this behavior is a result of a weakened condition documented by the TOPP lab last October. 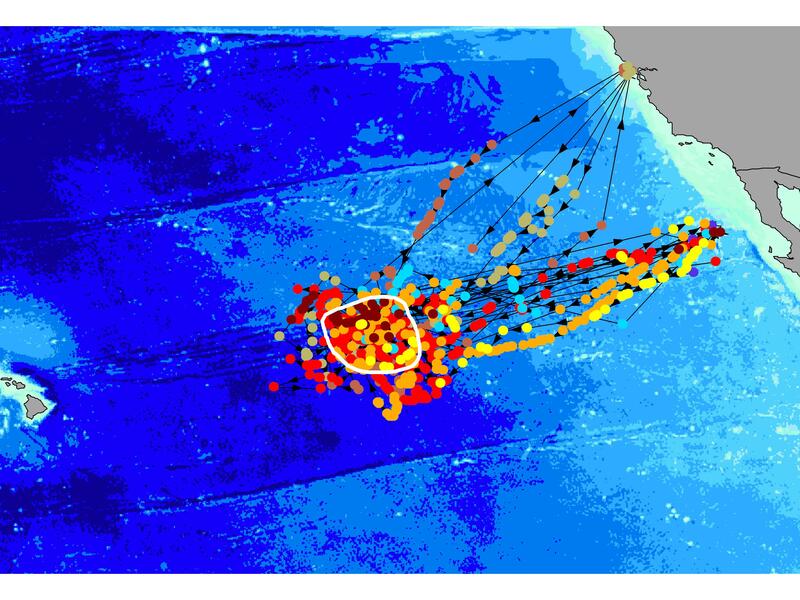 March, 2011 This map shows migration data over the last two years for all sexually mature male white sharks tagged by MCSI at Guadalupe Island, Mexico and the Farallon Islands off Central California. These are from white sharks that are tagged using SPOT tags which give real time tracking data for up to 6 years. 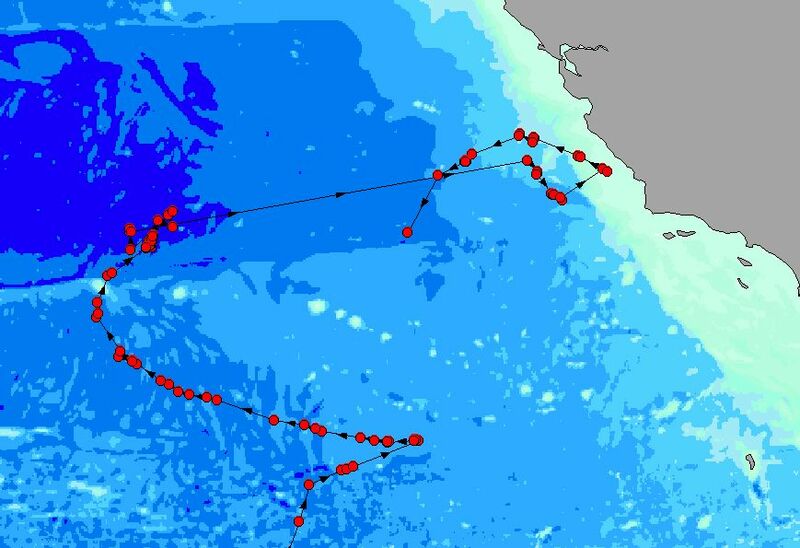 Eastern Pacific white sharks spend fall and winter at coastal aggregation sites at Guadalupe Island or central California and spring and summer in the middle of the Pacific Ocean traveling as far as the Hawaiian Islands. We are continuing to collect real time tracking data on our tagged sharks. The females tracks are beginning to shed light on the mystery of where they go when they are pregnant and where they go to give birth. We will know more this spring and be able to release this exciting data! Our white shark tagging and tracking study was recently featured in the shark edition of the online surf magazine Wave Lines (to view click here). 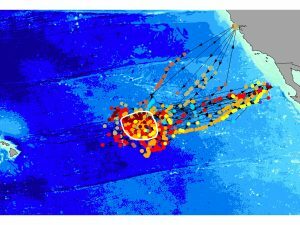 The data from these tagged sharks will help answer questions regarding which areas of the offshore region the sharks utilize and why they might be migrating to the middle of the ocean every year. It will also help us understand where they are mating, where the pregnant females go during their multi-year migration cycle, and where they go to give birth. All of this information is important in protecting these sharks. We are in the process of publishing exciting discoveries from this research and also hope to soon have a portal for the public to track our sharks in near real time…so stay tuned. 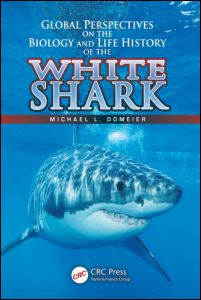 For more information on our comprehensive white shark research program click here.